Dag Arnesen has written hundreds of compositions, most of them tunes for small jazz ensembles. Here is a selection of more complex compositions that he has been commissioned to write for classical groups and large jazz ensembles. 1992 Reminiscence - suite in six parts for mini-big band with voice, 8 horns, piano, bass, drums and percussion– for Vestnorsk Jazzsenter. 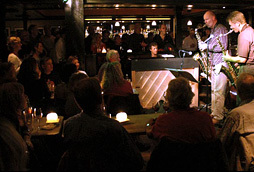 (The West Norway Jazz Centre) NRK Radio.